Cherry and Spoon: Minneosta Fringe Festival 2018 - Family Fringe: "Fruit Flies Like a Banana"
Minneosta Fringe Festival 2018 - Family Fringe: "Fruit Flies Like a Banana"
Summary: Three classically trained musicians (flute, trombone, and percussion) perform a series of short pieces accompanied by movement, dance, acrobatics, theater, and poetry. Highlights: This is the fourth year in a row that I've seen The Fourth Wall perform at the Fringe, and I never tire of watching their unique and delightful music/theater/dance/comedy/acrobatic performance! This year they're part of Family Fringe, a curated festival of six shows held at Celtic Junction in St. Paul, so the show is slightly tweaked for the younger set, but it's fun for all ages. C. Neil Parsons on bass trombone, Greg Jukes on percussion (mostly vibraphone), and Hilary Abigana on flute combine their talents both musical and otherwise to create a show that is unlike anything I've seen before. They perform short pieces both classical and contemporary, some composed specifically for them. But they don't just play the music. They play the music while on hover-boards, or dancing the tango, or chasing each other around, or hanging upside down. They're creativity and innovation are as amazing as their musicianship, and they really engage the kids by letting them pick the order of the shows and occasionally inviting them up on stage to help out. They have just one performance left - today at 1:30. Whether you're fringing or not it's more than worth a visit to St. Paul's Midway neighborhood and the $10 ticket. 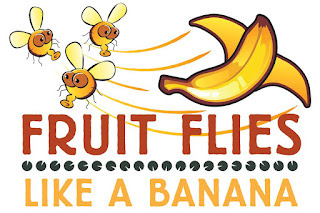 Time flies like an arrow, and fruit flies like a banana!